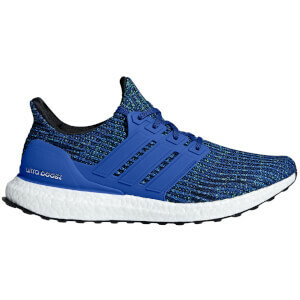 Supercharge your run and experience consistent performance in any conditions with the adidas ‘Ultra Boost’ running shoes. boost™ technology and its energy returning design keeps every stride charged with ultra-light and quick energy. The seamless and stretchy Primeknit upper fits snugly around your foot and adapts to the changing shape of your foot as you run. Lined with a featherweight sockliner, the ‘Ultra Boost’ bootee construction provides a customised fit. The Torsion® System between the heel and forefoot and the external heel counter increases natural movement, stability and comfort. An elasticated Continental® stretchweb outsole moves with each foot strike and offers optimal grip in wet and dry conditions. Finished with adidas' signature three-stripe detail to the side and a logo on the tongue.